Management is the art of getting things done through people – Mary Parker Follet. To manage is to forecast and plan, to organize, to command, to co-ordinate, and to control – Henry Fayol. Administration is concerned wit h laying down suitable policies for the whole concern. 3.Is administration an art or a science? Management is both an art and s cience. 4.What are the three levels of management? authority; the first line supervis or the least. Lower level managers should al ways keep upper level managers informed of their work activities. The existence of a scalar(hierarchical) chain and adherence to it are necessary if the organization is to be successful. 6.What is espirit de corps? Spirit de corps means spirit of co-operation.since union is strength,har mony and team work are essential . Managem ent should encourage harmony and general good feelings among employees. Retaining productive employees should always be a high priority of managem ent. Recruitment and Selection Costs, as well as increased product-reject rates are usually assoc iated with hiring new workers. Line of authority must flow in a downward flow from the highest authority to the worker at the bottom level. To avoid delay, such a direct contact, as the one between E and I is what is referred to as ‘Gang Plank’ which is indicated by the line in the diagram. 9.What is meant by unity of direction? The entire organization should be moving towards a common objective in a common direction. 11. Who is known as father of modern operation of management theory? 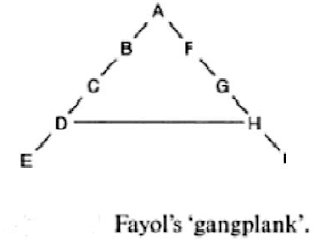 Henry Fayol is known as father of modern operation of management theory. 12. State any two Henry Fayol’s principles of theory. 1.What are the differences between administration and management? Management is not a static body. even be removed from service. It is a lower-level function. 2. Explain the functions of top management? a. Top management lays down the objectives and broad policies of the enterprise. c. It prepares strategic plans & policies for the enterprise. d. It appoints the executive for middle level i.e. departmental managers. e. It controls & coordinates the activities of all the departments. f. It is also responsible for maintaining a contact with the outside world. g. It provides guidance and direction. h. The top management is also responsible towards the shareholders for the performance of the enterprise. 3)Explain the functions of middle management? i. They execute the plans of the organization in accordance with the policies and directives of the top management. j. They make plans for the sub-units of the organization. k. They participate in employment & training of lower level management. l. They interpret and explain policies from top level management to lower level. m. They are responsible for coordinating the activities within the division or department. n. It also sends important reports and other important data to top level management. o. They evaluate performance of junior managers. p. They are also responsible for inspiring lower level managers towards better performance. 4. Explain the functions of low-level management? a. Assigning of jobs and tasks to various workers. PART-C (15 marks) 1.Describe the importance of management in business? 1) Systematic approach to work: Planning, which is one of the important functions of management, provides for a systematic approach to work. 2) Mobilization of the necessary resources: Every business needs men, machines, materials and money. The extent to which these resources are required and the proportion in which these are to be combined are taken care of by organizing which is yet another important function of management. 3) Division of work: Management recognizes the need for division of work in any work place. The total work to be done is divided into different parts and each part is entrusted to a particular individual. 4) Selection of the right man for the right job: Management gives utmost importance to the selection of the right man for the right job. The staffing function of management takes care of the issues concerning the recruitment and selection of employees. 5) Manpower development: The candidates, who have been selected for the various jobs, may not have practical exposure to work. 6) Inducement of workers: Another important role played by management is in the matter of motivating the employees of the organization. Motivation may be done by means of monetary as well as non/monetary measures. Even a word of appreciation may motivate an employee to work harder. 7) Stability of tenure: Retaining productive employees should always be a high priority of management. Recruitment and Selection Costs, as well as increased product-reject rates are usually associated with hiring new workers. 8) Integration of business activities: In a business a number of activities like purchase, production, marketing and sales take place. There are separate departments to look after these various activities. 9) Performance of control: It is necessary for every business to find out whether what has been planned has been achieved at the end of the plan period. In other words, the deviations from the target need to be measured. Corrective action needs to be taken so that no such problem arises in future. Performance of control is also an important task of the m anger. 10) Fulfillment of social obligations: every business is part and parcel of the society. The business derives all the benefits from the society and therefore, it owes certain duties towards the various sections of the society, namely, the shareholders, the creditors, the consumers, the employees, the competitors and the Government. Management has relevance not only in business but also in household work, in army, in governmental activities and so on. The work can be done in a more systematic manner with the application of the techniques of management. Management focuses attention on the attainment of specific objectives. By making a proper forecast of the sales, by planning production, by fixing targets for the salesmen and by properly co-ordinating all the activities, the targeted level of sales can be achieved. The practice of management requires application of mind and intelligence. Management does not accept the hit or miss approach to work. The necessary resources have to be acquired. Work has to be assigned to different individuals and responsibilities have to be fixed on them. Management is essentially a process consisting of various stages/.functions. planning is the starting point of management and control is its last stage. In between there are other functions like organizing, directing and co-ordinating. The practice of science needs knowledge of the theory as well as the formulae. On the other hand, the practice of art requires skill. Management is a social science. It focuses attention on the behavior of individuals and groups. Management deals with the behaviour of individuals and groups. In a work place, individuals work as a team. The goal of an individual employee and that of his organization must synchronize. Management is a continuous process. A stage will not be reached where one can say that management is irrelevant. Management is invisible. It cannot be seen. But it can be felt. The significance of management will become clear if a comparison is made. Like medical, law and engineering, management has also come to be recognized as a profession. He can provide consultancy services to businessmen on such areas as marketing, personnel or finance depending upon his area of specialization. Management is also considered as a factor of production just like land, labour, capital and enterprise. 3.Explain the various functions of management? The important management function can be categorized into four major functions. These are - planning, organizing, leading and controlling. Planning is the management function that involves setting of goals and deciding the best method to achieve them. Planning is most important and basic activity of management. The function also includes considering what must be done to encourage necessary levels of change and innovation. Planning provides a basis for the other major functions of management: organizing, leading and controlling. Manager with his subordinates sets the required goals, establishes the policies, standard methods, develops program strategies and schedules to achieve the goals. Organizing is the management function that focuses on allocating and arranging human and non-human resources so that plans can be carried out successfully. Different tasks must be assigned to different people and their efforts must be co-ordinated. This involves co-ordination of tasks and the various ways to accomplish it. In management process organizing function provides valuable tool for promoting innovation and facilitating needed changes. (v) Employee transfer, promotion, demotion and termination. (ii) Issuing orders and instructions pertaining to work. (iii) Proper communication relationship between the management and the employees. (iv) Leadership – to guide employees. Controlling is the management function aimed at regulating organizational activities so that actual performance meets the expected objectives and standards of company. For regulating organizational activity manager’s need to monitor ongoing activity, compare the results with standards and take the necessary corrective action. 4. Explain the contributions of Henry Fayol? The other major contribution of Henry Fayol to the development of management thinking is principles of management. Fayol outlined a number of principles that he found useful in running his large organization. 1. DIVISION OF WORK: Work should be divided among individuals and groups to ensure that effort and attention are focused on special portions of the task. Fayol presented work specialization as the best way to use the human resources of the organization. DISCIPLINE: A successful organization requires the common effort of workers. 5. UNITY OF DIRECTION: The entire organization should be moving towards a common objective in a common direction. 6. SUBORDINATION OF INDIVIDUAL INTERESTS TO THE GENERAL INTERESTS: The interests of one person should not take priority over the interests of the organization as a whole. 7. REMUNERATION: Many variables, such as cost of living, supply of qualified personnel, general business conditions, and success of the business, should be considered in determining a worker’s rate of pay. 9. SCALAR CHAIN: Managers in hierarchies are part of a chain like authority scale. The President possesses the most authority; the first line supervisor the least. Lower level managers should always keep upper level managers informed of their work activities. The existence of a scalar(hierarchical) chain and adherence to it are necessary if the organization is to be successful. increased product-reject rates are usually associated with hiring new workers. 13. INITIATIVE: Management should take steps to encourage worker initiative, which is defined as new or additional work activity undertaken through self direction. 14. ESPIRIT DE CORPS: Management should encourage harmony and general good feelings among employees. 1) Creative: Managers have to come with creative ideas or solutions to handle unique business problems. 2) Individual approach: Every manager need to adopt his individual approach of managing to handle situations. 3) Application and dedication: Management requires not only skills and knowledge but there is also a need for discipline, dedication and commitment. 4) Initiative: Managers are like artists take the initiative in doing the right things at tight time. This helps to accomplish objectives more effectively and efficiently. 5) Intelligence: Managers should possess mental intelligence, social intelligence, inter personal intelligence and emotional intelligence. 1) Systematic decision making: management stars with the process of systematic decisions. Before taking any right decisions right information from right source and at right source and at right time is to be collected. This process has to be followed systematically. 2) Situational output: the output of management process may vary without change in input. This is possible by providing some resource, tolls, incentive and by motivation. 3) Universal management process: in all management organizations whether large or small, and at all levels, follows the same management process. The management process includes – planning, organizing, directing and controlling activities. 4) Universally accepted management principles: like science, the principles of management are universally accepted. These principles are accepted by all successful organizations. Management principles include – division of work, unity of command, discipline, scalar chain etc. Therefore it can be concluded that management is an art as well as science.